Can Playing Bridge Extend Your Life? Newsletter Retired – Past Issues Available Only Via Email! Do you receive our updates about upcoming bridge classes? If you would like to receive our periodic email updates, please sign up by clicking the button below. We are passionate about the game of bridge. Love to play it and love to teach it!! Leslie and Charlie will make sure you have a great time in their classes. If you have fun on your learning journey it will sink in better and you’ll have a great time. Sounds great, doesn’t it? Leslie Shafer, her husband Ralph “Charlie” Williams (aka Studmuffin), and Hank Meyer are all certified ACBL Accredited Teachers. They have been teaching bridge for over 15 years. 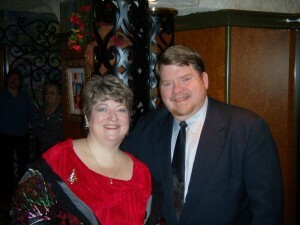 Charlie and Leslie jointly have been writing a bridge student newsletter for over 10 years. You can find out more about our newsletter on this same website. Leslie is a monthly columnist in a national bridge magazine (ACBL Bulletin), past President of the American Bridge Teachers’ Association, and has Master Teacher status with the American Bridge Teacher’s Association. She also won the coveted American Bridge Teachers Association 2016 Bridge Teacher of the Year Award! Charlie is a certified director and also has an ABTA Master Teacher status. We believe that if you are not having fun at bridge then you’re not going to perform well (bidding, play or defense). Bridge should be fun. Don’t take it too seriously, it is, after all, just a game. However, what all three of us have in common and believe in: That bridge learning is easier when delivered with comedy, drama and theatrics. We do our utmost to entertain you and make your bridge learning process as fun as possible. We believe that the more hands you play, the faster you’ll learn. We are not lecturers! Rather, we give you a short lesson (usually no more than 10-15 minutes) and then get you playing hands as soon as possible that will emphasize that particular concept. You will play more hands in our classes than most all other teachers combined. Playing as many hands as possible in class (and on your own) will give you the confidence and skills you need to succeed. And besides, playing bridge is a lot more fun that hearing a long, dull lecture. Our best known teaching method is humor, sometimes very risque. Come to class prepared to laugh, smile and simply have a marvelous time. Please Email Us! if interested in bridge classes. We’ll get back to you as soon as we can.